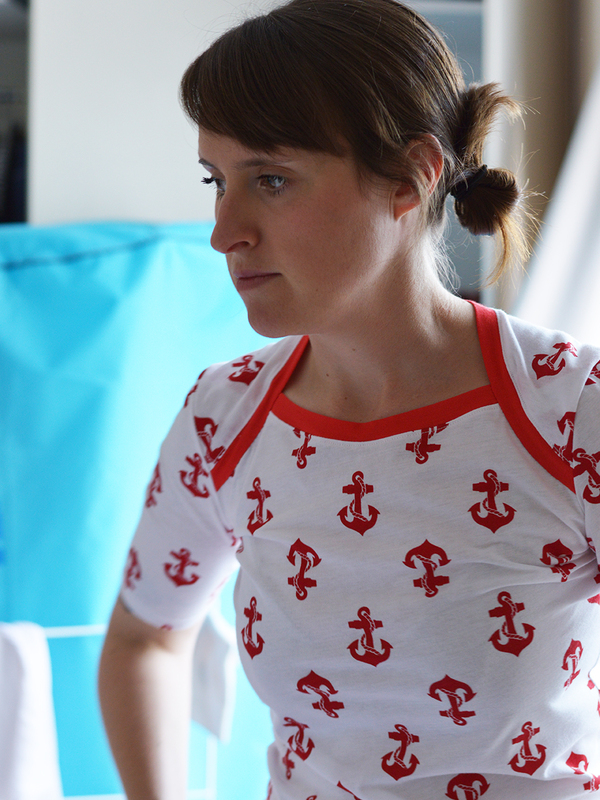 Time to take a close up on the first of the three garments I recently made with fabric given to me by Girl Charlee. This anchor Bronte top is quite the eye catcher, isn't it?! I'm literally wearing my nautical obsession on my sleeve here. For some reason, when I share a new creation, I usually prefer to discuss the pattern before the fabric choice. However, I'm going to flip it round this time because this project was very much fabric-lead. As I mentioned in my previous post, I'd been given 2 metres of this fabric to make something from and then review it on my blog, so that's what I'm damn well going to do. There must be people who buy all their sewing fabric online. I'm not used to online fabric purchasing, so it feels like quite a gamble to me. You just have to hope that the site's descriptions are accurate and that you like what turns up, I guess. 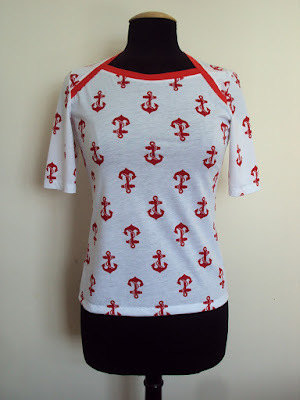 I certainly did like this anchor print jersey when it turned up. The description about softness and stretch are true, but I'm not sure I would include the bit about drape if I were writing the copy. I was expecting it to be suitable for my Dolores batwing pattern, but I had to rethink when it arrived. I'm glad I read how large the anchors are before choosing it, otherwise I think I might have had a mild shock! I love the crisp printing and the boldness of the scale. 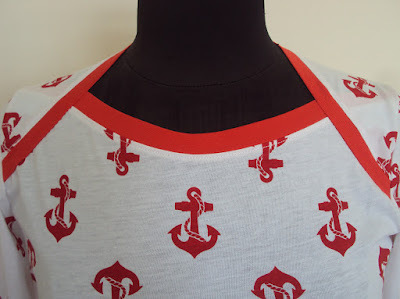 The contrast binding trim is made from scraps of super fine red jersey I had in my stash. The binding is a bit more tomato-y than the deeper red of the anchors, but it's close enough, especially if you squint. Because the solid red jersey is so fine, I decided to slip-stitch the edge where the back neck binding overlaps the front at the shoulders by hand to stop it flapping up, rather than top-stitching with the machine as I would otherwise do. Once the fabric arrived and I discounted a Dolores garment due to insufficient drape, I had to scheme up another plan. The fineness and stability of the fabric leant itself to a more form fitting garment, and I went back and forth between picking the Bronte top by Jennifer Lauren Vintage and Tilly's Agnes pattern. I eventually landed on the Bronte top because I wanted to have fun with some contrast neck binding to break up the intense print, although I adjusted the sleeve length to be like the Agnes because I think it's really flattering as well as comfortable. This is my third Bronte top, my first was in the capacity of pattern testing, then I made a black 3/4 sleeve version last year. 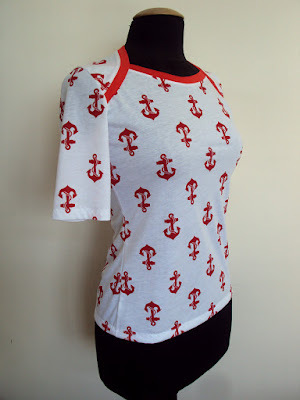 I think I prefer the sleeve length of this anchor version, it suits the 'lady like T-shirt' vibe. 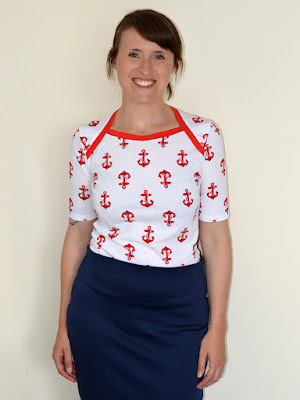 Actually, technically this is my third and forth Bronte top: 2m of the anchor fabric gave me sufficient fabric to make two identical tops (I sent one to my best friend, who loves it so much that she has commissioned more). Plus, I still have enough left over for a pair of toddler leggings! I wore this top all day Saturday whilst helping out at the Fabric Godmother's open day where I got to hang with a number of awesome members of the sewing massive, including Rachel from House of Pinheiro, Louise from Seams Odd, Louise and my old mucker, Rehanon from Miss Demeanour (proof, if required, above). The top felt comfortable and certainly garnered a few compliments throughout the day. Such a bold top probably won't see multiple wears during one specific week, but it certainly is a welcome and very fun addition to my wardrobe. Whilst it is very 'me', this fabric obviously won't be for everyone. But if you are considering this as your selection to enter the Girl Charlee fabric giveaway, I don't think you'll be disappointed to receive it if you are the lucky winner. I'm glad your top turned out though, and it looks adorable! Way to make it work! I really like the neckline on this top, and the sleeve length. I love your shirt! It came out very cute! I purchase 90% of my fabric online because where I live (Cleveland) the fabric options are limited to basically Jo Anne Fabrics which is more geared toward the craft and quilt shopper. It's pretty obvious their buyers don't have a clue when it come to apparel fabric. We are starting to get a few independent shops that carry organic cottons and other interesting fabrics, so I take that as a hopeful sign! Great review. I've looked at this fabric and wondered if the anchors were too large, but I like it in the shirt you made. Also, I like how your bangs are a little side-swept these days--very flattering! (Not that you asked anyone to comment on that, but it's always nice to hear.) I agree about online fabric shopping, and I have had one disappointing experience ordering from Girl Charlee, but that was actually my fault--I had in my head what a certain type of fabric was like and because I was too impatient to order a swatch, I ended up with three yards of fabric I didn't love. So, now I've gotten smarter (and more patient), and started ordering swatches. I even found a use for the fabric I ordered, and it's on my sewing table as a trial run of Tilly's Coco dress that I won on your site during MMMay '15! Cutest print! 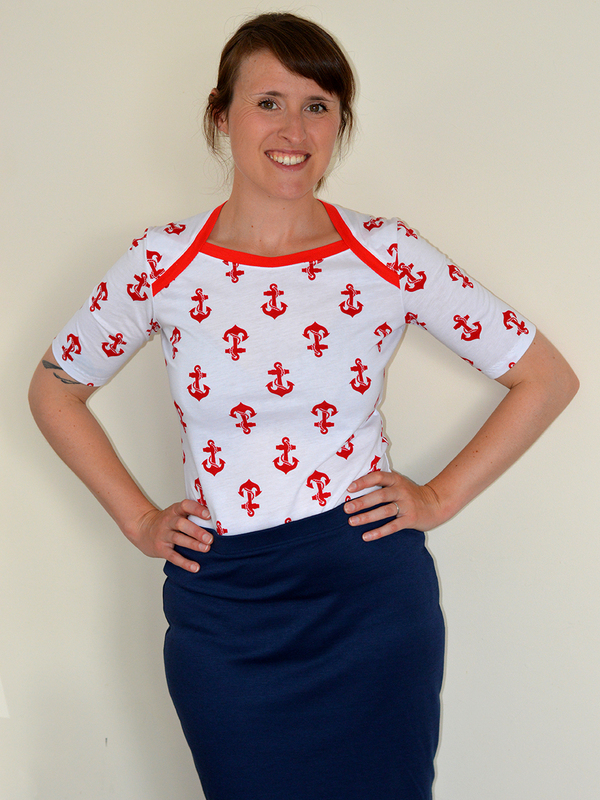 I think the neckline is perfectly nautical! Great combo. 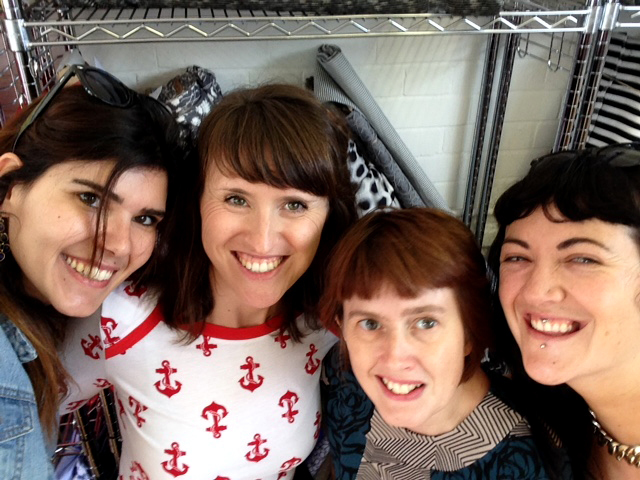 Refashion Friday: The Refashioners 2015 Result!